Although one of the main attractions in Ellicott City is a beautifully restored old Mill Town built in 1772, it also includes much more. The historical Main Street includes a wide array of restaurants, museums and shops. 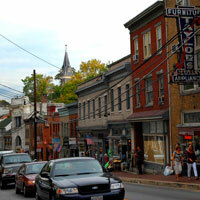 Historic Ellicott City is one of those rare towns where people from all walks of life converge. Suburban teenagers, bikers, aging hippies, yuppies, New Agers and good ol’ boys coexist in mostly tranquil harmony. Welcome to your new home! Beautiful end of townhome with many updates. Plenty of natural sunlight. Gorgeous deck (2015), right off the living room. Gas Fireplace, perfect for those brisk evenings. Spacious master with a full on-suite. Lower level with a nice size family room that walks out to the backyard, perfect for rest and relaxation. Brand new Carrier Furnace, HVAC unit & Nest Thermostat. Also, most recently Installed 5 Gallon Irrigation System w/ French Drains. Lets Take a Tour!